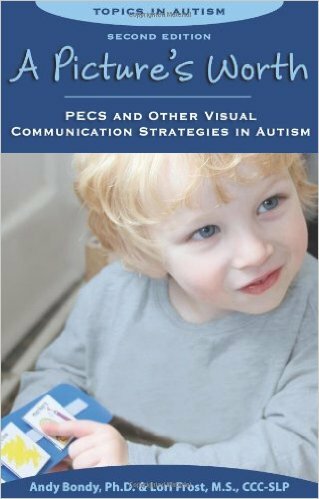 A book that discusses communication and then proceeds to introduce the reader to the Picture Exchange Communication System and other visual communication strategies that are used to help autistic people communicate. Since this book is written by the two professionals who first developed PECS, Andy Bondy and Lori Frost, a significant amount of the focus is on PECS, but it does branch out into other areas and include more up-to date information by including some information on apps. The problems associated with the lack or weak use of critical functional communication skills remain a significant barrier for the independent functioning of many children and adults. In many instances I would argue that developing a functional communication system is the most important thing a parent, carer or teacher can teach an autistic person. I am sure people have seen lessons in schools or therapy where students repeat matching tasks or tracking tasks or “copy me” instructions but still have no means of communicating, and I sometimes wonder what the point to this is? My primary focus is always to help the students I work with to communicate. These are not exhaustive lists of all the expressive and receptive skills that Bondy and Frost believe should be learnt, nor are they all that PECS can help to teach to communicate, but they are what the two authors believe are the most critical skills and so are the main focus of this book. If we are to study the behavior of communication, the first thing we should define is how it is different from other types of behavior. Not all behaviors are communicative, so we must identify what is unique about behaviors that we do call communicative. Now this section is important because of a misconception that has grown within the field of autism, namely “all behaviour is communication”. You don’t have to search far to find this piece of advice – if you frequent a forum where people ask for advice on a way their autistic child or student is behaving then I imagine you’ve seen it already. Professionals say it, parents says it, and autistic self-advocates say it. But it’s not true. All behaviour is not communication – not everything an autistic person does is designed to communicate to someone else. Think of all the things you do throughout a day, are they all attempts to communicate? In the absence of a functional means of communication, then some or even a lot of behaviour can be communication, but not all of it. After introducing and discussing communication, both expressive and receptive, and the difficulties with having no means of communication and the benefit of acquiring a means of communication, the book moves on to discuss the relationship between behaviour and communication. In this section anecdotes are analysed to show the different factors that should be considered when analysing behaviours to determine whether they are attempts at communication, and if so what they are communicating. It then moves on to discussing factors that have an impact on learning a functional means of communication. Then it outlines, step by step, how to teach a child to begin to communicate “Help”. Following that is a chapter on Augentative and Alternative Communication Systems where different types are discussed and a lot of information on AAC is provided – both unaided (such as gestures and sign language) and aided (such as PECS or AAC devices). There is also a table which lists a few of the apps that are currently available to buy for the iPad. This chapter also has a brief introduction to the use of AAC devices and apps along with questions that parents, carers, and teachers should ask before designing and implementing the use. Then we get onto the PECS section with a history, a discussion of the prerequisites, and a series of questions to determine whether someone is an appropriate candidate for PECS. Then follows a details, guidance and information on the Phases of PECS up to Phase 6 (the final phase). Whilst this is obviously not as in-depth and informative as the PECS Training Manual is, it covers a lot of information in a relatively short amount of time which allows someone to get started with PECS straight away. Additionally, this book is a lot cheaper and easier to get hold of than the PECS Training Manual. I am confident that a lot of people could use this book to get PECS up and running with their student. It doesn’t cover all eventualities but it does have enough detail to make PECS accessible to parents, carers and teachers. The final section is on the use of visual strategies to enhance understanding and includes information on helping to understand instructions, how to use a schedule, how to understand changes in routine or expected outcomes, how to understand the concept of wait, dealing with transitions, and how to “Make a Deal” and use visual reinforcement systems. Again, these are all areas covered in greater detail in the Training Manual, but more than enough information is provided here for someone to work with and develop a good system. Once a child has learned to request her favorite snack, eventually she will ask for the snack at a time when you do not have the snack with you. You are likely to say, “Wait! I’ll go get it!” In such situations, it is important for the child to understand that “wait” is different than “no”. When we say, “wait” to a child, we have essentially made a promise, as in “I know what you want and you will get it, but you will get it somewhat later than you expected”. What helps to make this book even easier to understand is the use of anecdotes and examples throughout the book which help to highlight to the reader the points and information that the authors are trying to get across. These anecdotes are included throughout all the sections of the books. If there is an area that this book is lacking in then it is, ironically, in the area of including visuals to support the information on the page. There are quite a few, but the size of the book obviously limits how many can be included, and so it is difficult to criticise the authors for not including more, even if the presence of more visual examples would have improved it. If you want to start using PECS with someone then this book gives you a clear step-by-step guide to getting started. If you are getting a student in your class or are otherwise going to be working with someone who uses PECS as their primary means of communication, then this book will help you understand the system. Even as just an introduction to communication in autistic people, this book has value. Previous Communication Series: An introduction to AAC devices and AAC apps.